VIDEO - Bird flu spreading in Israel: The Ministry of Agriculture has placed severe restrictions on the areas of Kibbutz Ein Hashlosha, Nirim, Kissufim, and Holit in the south, following the outbreak of the bird flu virus. Three residents of the southern kibbutzim of Ein Hashlosha and Holit and a man from the Sde Moshe community near Kiryat Gat were evacuated to Soroka Hospital in Be'er Sheva and Barzilai Hospital in Ashkelon Friday for fear they contracted the bird flu virus, which was discovered in poultry in the area Thursday. However, the four people hospitalized do not have the disease, tests revealed. Noam Tamir, a chicken farm owner in Sde Moshe, told Ynet that the outbreak began three days ago, adding that hundreds of chickens have died. The Ministry of Agriculture's veterinary services have halted exports of unprocessed chicken products from Israel to countries abroad, due to the outbreak of the bird flu virus, and in accordance with international agreements over the issue. The European commissioner has banned imports of live birds and meat from Israel, following the outbreak of the lethal strain of bird flu. Director general of the Soroka Hospital, Dr. Eitan Hai-Am, said that the Health Ministry has prepared in advance for the possibility of a bird flu virus outbreak. "It needs to be stressed that there have been only a few cases of people contracting bird flu the world over, and that the chances of contracting the virus are slim. However, we must treat anyone suspect of having got the disease. Therefore, anyone who comes here with fear of bird flu is isolated upon entering the emergency room and treated accordingly," he explained. Hundreds of thousands of poultry in Ein Hashlosha and three neighboring kibbutzim – Nirim, Kissufim and Holit, as well as in kibbutz Nachshon in the heart of Israel, will be exterminated in the next two days. Meanwhile, the Ministry of Agriculture turned to Holland and asked that 4 million bird vaccines will be flown to Israel. Officials in the Agriculture Ministry are becoming increasingly concerned the bird flu virus detected in Ein Hashlosha and the community of Holit is of the lethal H5N1 type. Closure has been imposed Friday on Ein Hashlosha, Holit, Nirim and Kissufim. The process of exterminating the poultry has already begun at the southern kibbutzim and is scheduled to last between 36 to 48 hours. The birds will be killed using poison that will be inserted to their water supply. Overall, some 200,000 birds will be eliminated in kibbutz Kissufim, 40,000 in Nirim and 36,000 in Ein Hashlosha. Louis Rothman, a poultry farmer from Ein Hashlosha told Ynet: "For me it's a hard blow. These birds are my life, I never killed birds like this." The Ministry of Agriculture held a press conference Friday noon in which it reported the virus has yet to be positively identified. Shimon Pokemonski, chief veterinarian for poultry diseases at the veterinary services, said that while the virus has not been isolated so far, tests indicate it is highly likely it is of the H5N1 type. Pokemonski said that conclusive results will be available in the next few days. Agriculture Ministry Officials also reported that they have contacted the Palestinian Authority in order to update counterparts on the matter, as kibbutz Ein Hashlosha is located only several kilometers away from Gaza. 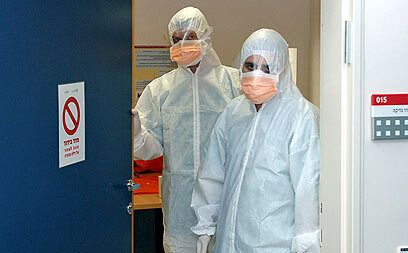 The Ministry has also contacted the police, in case further quarantines will have to be imposed. According to the Ministry, Israelis can continue to consume eggs and poultry as normal, as long as these were purchased in orderly places and cooked properly. The veterinary services have already updated all relevant factors in Israel and abroad on the issue. See all talkbacks "Bird flu: People hospitalized not infected"